As part of a website redesign communication campaign, I was tasked with developing a web-based crossword puzzle for our intranet site (MOSS 2007). After some brainstorming I came up with a solution that seems to be effective and relatively easy to set up using a custom list to store the answers, some jQuery to enhance the interactivity of the crossword, and SPServices to submit the answers to the list. 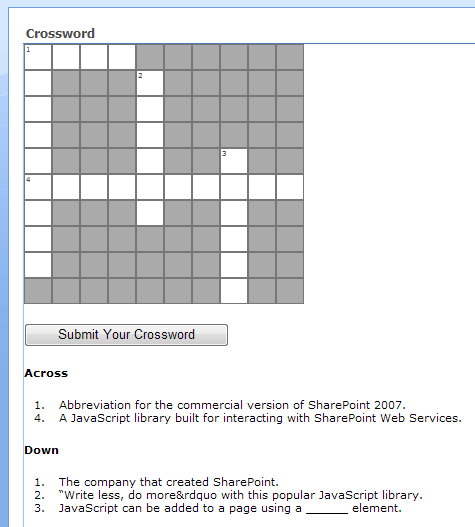 Check out a demo page of the crossword (it won’t actually submit because it’s just a standalone HTML page and it isn’t on a SharePoint server). 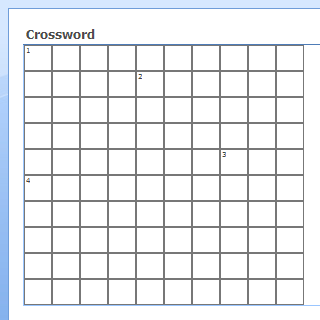 I started by creating a prototype of the crossword in Excel. This allowed me to get my grid and clue numbers figured out before any development. Crossword puzzles by convention are numbered starting from top-left and moving down to the bottom-right. In other words, the start of the first word in the top row will be number 1. It’s orientation determines if it is 1 Across or 1 Down. Some numbers will have both an Across and Down orientation. This is important to keep track of because you’ll need a list column for each clue response. For this demo I’m using a very simple crossword with just five clues. 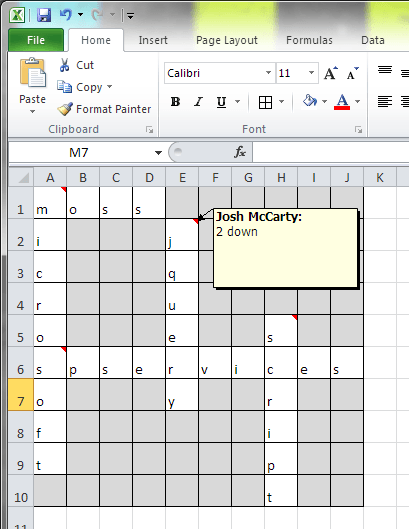 Excel is a great tool for mocking up your crossword before you start coding. I recommend noting the clue numbers with comments. Now that we know what clue numbers we’ll need and in what orientation, we can create the custom list. Once the list is created, add a single line of text column for each clue. I labeled them “[Number][Orientation]” for easy reference. For example, the column for clue 1 Across would be called “OneAcross.” If there is also a clue for 1 Down, you’d create another column called “OneDown.” Do this for all of the clues in the crossword. Create a single line of text column for each response in your crossword. At the risk of offending semantic purists (with whom I usually agree) I decided to use a table to create the crossword grid. To start, create a simple table with a <div> inside each cell for every grid square in your crossword (e.g. if you have a 10×10 grid, we’ll need ten table rows with ten cells in each row). The <div> ensures that the empty cells will display correctly with a border across all browsers once we add some CSS. You could do this in a Content Editor Web Part on a web part page or add it to a custom NewForm page for the Crossword list. Now that we have the grid set up, it’s time to add the numbers for each clue. Start at the top row and find the first <td> that should contain the first letter of an answer. Inside the <div> add a <span>[ClueNumber]</span> where [ClueNumber] is the number of the clue. The first <span> added to the grid should be <span>1</span>. Do this for all remaining rows. Before we get much further, it’d be a good idea to look at the table and make sure the clue numbers are in the right location. To make this easier, add some CSS to the page to format the table cells into squares with borders. With some CSS applied, you should now be able to view the table grid and make sure that the clue numbers are in the correct location. This isn’t a necessary step for the crossword to function, but for styling purposes I added a class of “empty” to the table cells that won’t contain a letter for a response. As with the clue numbers, start at the top row and add the class to each table cell that won’t contain a letter for a response. The letters for the responses will be entered using text inputs. Once again starting at the top row, find the first <td> that should contain a letter for a response. Inside the <div> (and after the <span> if it’s present) add an <input type="text" maxlength="1" class="[clue]-[orientation]" /> where [clue]-[orientation] is replaced with the clue number and orientation that the input is used for (I always use hyphens for class names rather than camel case, but you can use your preferred convention). If the input is used for two responses, include two classnames—one for each clue number and orientation. Note: You could also add tabindex attributes to each input, but I couldn’t think of a good way to do this that takes into account both horizontal and vertical words. The default tab order isn’t terrible, and most users can always use the mouse to place the cursor in the desired input. I figured that messing with this too much might detract from the accessibility of the crossword (and we’ll be writing some jQuery to help navigating the inputs in the crossword using the keyboard arrow keys). I welcome any suggestions for this in the comments. The crossword clues won’t look that great without applying styles to them. I used the following CSS, but you can adjust it to fit your preference. Be sure to test any changes to this and the previous CSS for the crossword table in all browsers that your users might visit the page with. I’ve tested this in IE7+, Firefox 9, and Chrome 18. You should now have a crossword, submit button, and the crossword clues formatted. The crossword is usable as-is, but I wanted to provide some enhancement to make navigating the crossword by keyboard less cumbersome. For the record I’m using jQuery 1.7.1 and SPServices 0.7.1a (be sure to include them on your page before writing any other scripts for this demo). I included the following script inside a $( document ).ready() function. The script allows for navigation by arrow keys, prevents users from inputting a space character by accident, and automagically moves the cursor to the next input in the word they are currently typing (it isn’t foolproof, but in general it works OK). I included several comments within the script to explain what is happening. // Don't do anything if the Tab, Shift, Backspace, Space, or Delete keys are pressed. // Automagically remove spaces when they are typed. // Automatically focus on the next appropriate input once a letter or symbol is entered or an arrow key is pressed. // This is sort of a best-guess interaction based on where the user is typing. // Cache several variables that will be used to move focus to other inputs in the crossword. // If we try to get an input that doesn't exist, the script fails gracefully by simply not moving focus to another input. // Cache the class of the current input. // Cache the table cell containing the current input. // Cache the index of the current table cell. // Cache the next input to the right of the current input. // Cache the previous input to the left of the current input. // Cache the value of the next input to the right of the current input. // Cache the next input below the current input (this is why we need the column index of the current table cell). // Cache the previous input above the current input (this is why we need the column index of the current table cell). // If the arrow keys are pressed, go to the appropriate input (if available). nextDown.focus().addClass( "force-down" ); // If user pressed the down arrow, they probably want to continue typing a down response. // ...otherwise focus on the next down input and add the force-down class to the next down input. // If the input is ONLY for down responses focus on the next down input and add the force-down class to the next down input. // If the input is ONLY for across responses focus on the next across input. // Remove the force-down class once the focus has moved on from the current input. Now that we have all of our markup and interactivity created, we still need to handle the submission of the responses. This isn’t a traditional HTML <form> or a SharePoint form, so we need write a function to submit the responses when the submit button is clicked and include it in the $( document ).ready() function. The first step in this function is to include a check to make sure all responses are filled out (not necessarily correct, just not blank). If they aren’t the script doesn’t submit the responses. Next we display a confirm() message to make sure the user wants to submit the form and didn’t accidentally click the submit link. // If you decide to use a hyperlink instead of a button input, this will prevent the hyperlink from actually navigating away from the page or to an anchor. // Disable the button so the user can't click it again and submit the answers more than once. // Prevent submission if the crossword isn't completed. // Confirm that the user wants to submit their answers. This would select all <input />s that have the class name “one-across” in left-to-right order and append each letter (in order and lowercase) to the OneAcrossAnswer variable. We could then use this value in an SPServices function to create a new list item. I convert the letters to lowercase so all responses can be checked against a standard answer key without worrying about casing issues. Next create a batchCmd variable to hold the batch command that we’ll be building with our script. It will just contain the start of the batch command for now. We’ll append each response to it and close it later in the script before using SPServices. Now we’re ready to add the responses to the batch command. Using jQuery’s $.each() method, we can iterate over each response (using the response object we created) and add the appropriate information to the batch command using the properties of each response. // Cache the current item in the responses object. // For each input in the crossword associated with the current response object, get the values and save them in the answer property. Once the answers have been added, we can finish the batchCmd variable so we have a valid batch command for creating a list item in SharePoint. Now we can use the batchCmd in our SPServices function. Be sure to include the webURL and listName options for your crossword list, which will depend on where you created the list and what you named it. I’ve also included some basic error handling in the SPServices function and a redirect once the answers have been submitted. You can modify the code inside the completefunc function for your specific use-case. // If the AJAX call could not be completed, alert the user or include your own code to handle errors. // If there was an error creating the list item, alert the user or include your own code to handle errors. // if the list item was successfully created, alert the user and navigate to the Source parameter in the URL (or to a URL of your choosing). SharePoint has limits on the total number of columns that can be used in a custom list, which means you can’t have a crossword puzzle that has more clues than your list can have columns. The performance of this example is also dependent on the user’s browser and computer hardware. I’ve noticed that if I type a response too fast, the code that handles moving focus to the next <input /> can’t quite keep up and I’ll end up with a blank <input /> or two. You could always remove the code that changes the focus and let users simply navigate using the Tab key or their mouse to avoid this, or optimize the script further (perhaps bind to keydown instead of keyup). I think SharePoint can make a decent platform for simple games like this with a little creativity. Let me know if you have any suggestions/questions or if you’ve seen other game implementations using SharePoint in the comments! Great post and innovative solution! Original and a very interesting post! excellent. liking the stuff on your site. nice to run across a fellow sharepoint + web designer. Nice one, its really super man. carry on!!! You are my savior! This stuff is amazing and I am gonna implement it. Thank you! Hello is this solution also works with SharePoint 2010?